Start reading The Friend: Winner of the National Book Award for Fiction on your Kindle in under a minute. WINNER OF THE 2018 NATIONAL BOOK AWARD and a NEW YORK TIMES BESTSELLER: a moving story of love, friendship, grief, healing, and the magical bond between a woman and her dog. 4.0 out of 5 starsTruly great writing - IF you can read it. I'm not given to writing reviews, but I have to make an exception this time. As is often the case, there's good news and bad. First, the bad. The publishers deserve the firing squad, except since they DID have the good sense to publish the book, they get one star (and the author loses one). This is not a young adult book or one destined to be a best-seller, it's a book for lovers of fiction and the art and craft of writing it. So why, since most of its readers will be individuals wearing glasses, publish it in a font so small and with contrast so weak that some sort of magnification may well prove necessary? They'll have a chance, when preparing the paperback edition, to do better, and I'm writing this solely to encourage them to do that: MAKE IT READABLE. Second, the good. This is an important book. The author has created something original and, by its end, revelatory of how fiction comes to be - indeed, of what fiction IS. The prose style is dry, never poetic. (It's not 'academic' dry, it's 'journalistic' dry.) The plot is slight, and the digressions are many. But it's not - not ever - dull; there's not a wasted word in it. The pace is slow, but it's too interesting to put down. 3/4 of the way through, the author takes the reader on a detour that I was pretty sure was going to turn out to have been a bad idea. It wasn't; she knew exactly what she was doing. It turns out she's a fisherman (fisherperson?) who has been quietly letting out her nets all along, and when she hauls them in, her catch is bountiful. I'm impressed enough with "The Friend" that I'm changing the syllabus for a seminar I'll teach next fall, replacing a tried and true novel with this one, because it's such fine work. Brava, Signora Nunez! Five stars for the author - minus one for the publisher. PLEASE do better with the next edition; this is an important book! I bought this book because of a review in theNew York Times. I was eager to read it and am not sorry I did but, that being said, I was somewhat disappointed. The friend of the title may be either the friend of many years who has just committed suicide, or it may be the dog that he left to her. The book is written as though it were a letter to this dead friend and at one point she writes that one writes, in part, to grasp and get hold of a problematic subject. This would be the death by suicide of her friend. But the dog, who she starts out thinking of as purely a burden, becomes a friend, too and I can’t quite make out whether that is because he is a sort of contact with the dead man, but it also seems to be in his own right that she grows to love him. There are long passages about writing as an act, as an art, and as a therapy, it’s meaning, it’s burdens and its responsibilities. These became a little tedious to me; I do like a bit of a plot. You won’t find one here. The relationship with the dog is what I liked best. It is a poignant one. The dog is old and failing. Between the suicide and the old dog, there is much meditation on death and loss. I found the book quite sad but then, I am a terrific sucker for a dog. The books I read usually fall into one of two camps: sci-fi/fantasy or LGBT/queer fiction. *The Friend* is about as far from those categories as you can imagine. The setting is contemporary, there's no mention of time travel, and two of the three central characters are straight muggles with benefits. 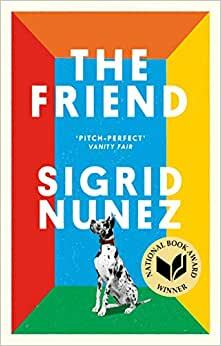 I'm ashamed to admit that I'd never even heard of Nunez before I read *The Friend*. I caught an interview with her on NPR around the time the book debuted. She was so smart and charming and eloquent, I thought I'd give the novel a shot. I was very, very pleasantly surprised. For starters, Nunez is an outstanding writer. Her turns of phrase leave most authors I know in the dust. And yet, she manages to wow the reader without being showy. Her sentences pack a punch, whether or not you majored in English lit. Also, the third major character is a dog. Anyone who knows me knows that I'm a sucker for dogs. Nunez captures the personality of her curious new friend perfectly, and their slowly blossoming love story is...well, it's better than most I can name. I found this novel written more like a writer's journal to be very moving. It is written in first person and although it has a story line, there is not really much plot. A middle-aged writer, who now teaches writing loses a writer friend who commits suicide. In the past, the friend was also her teacher and briefly her lover. After his death, his huge Great Dane is left grieving and alone, a fate shared by the woman, and so she adopts the dog. Some of the chapters describe an incident, but others are short broken musings. The description of the interaction between the woman and the dog is wonderful, but there is also a great deal of material on thoughts that the friend's death seems to have stirred in the woman. If you like dogs and literature, you would probably like this book, but don;t expect a lot action.. I loved every page of this book. But - fair warning! The dog part of the novel doesn't really start until around page 80. I didn't mind too much because I was enjoying Nunez's writing immensely; still, I was anticipating the dog part of the story. (sometimes I think one would be better off not reading reviews) I thought about the book for days after reading it - the narrator stayed with me, she made me think, and I wished I could sit down with her and have a good long talk. Preferably with a bottle of wine. This is the first book I've read by Sigrid Nunez, and I'm looking forward to reading more of her work.